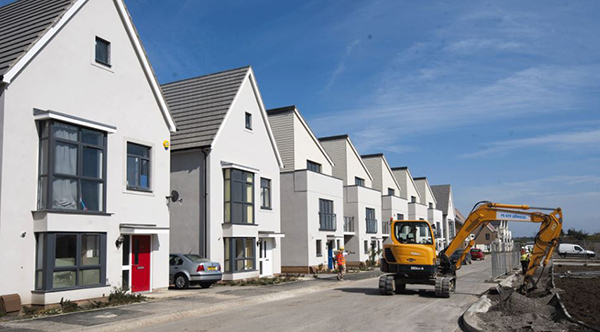 Persimmon again applied to build more private new-build homes through the planning system last year than any other housebuilder. New construction market analysis from Glenigan, which covers only private new-build housing, shows that the number of units in detailed planning applications submitted by Persimmon rose by 6% to 20,853 units. Barratt, Taylor Wimpey and Bellway all remain in second, third and fourth place respectively in the latest table, while a surge in Crest Nicholson’s planning programme takes the group into fifth place. Bloor was placed fifth in 2017 but slipped to eighth place last year after a reduction in its planning pipeline. 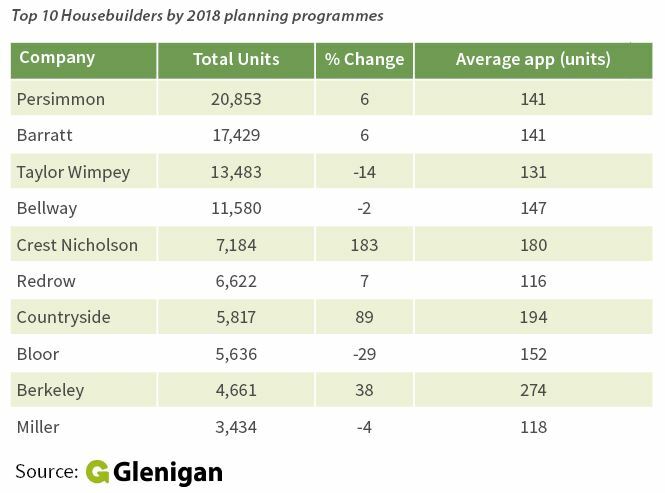 Keepmoat drops out of the top 10 altogether as its planning programme contracted by half in 2018 according to Glenigan’s construction research. Glenigan’s economics director Allan Wilén comments: “A reduction in the number of units in housebuilders planning applications could be for a range of reasons. The average planning application submitted by both Persimmon and Barratt last year included 141 units. The largest average number of units in submissions last year was at Berkeley. The planning pipeline grew by 38% at Home Countries and London-centric Berkeley, whose applications featured an average of 274 homes. Crest’s pipeline also grew through an increase in the size of the average project, which rose to 180 units in 2018 form 110 in the previous year. Glenigan’s construction market research also shows a large increase in volume housebuilders working with major private investors to bring forward land. Barratt, for example, is working with Harworth Group on a range of schemes, such as the Torne Park development at Rossington in Yorkshire. Investment companies involved include IM Properties, which is working with Bloor on developments such as the Blythe Valley scheme in the West Midlands. Avant is working with Catesby Property at Europa Way in Warwick and Redrow with Omega Warrington. Other commercial developers and investors working with volume housebuilders according to Glenigan’s construction research include U+I Group and M&G Real Estate, which is working with Telford Homes. A host of Special Purpose Vehicles have also been set up and are developing land through the planning system. There is also a swathe of volume housebuilders submitting applications jointly. Partnerships range from Bovis and Wain, to Miller and Wates and Persimmon with Taylor Wimpey. Elsewhere, Croudace is working with Barratt subsidiary David Wilson Homes and Bloor is developing schemes through planning with Bellway, Redrow and Gallagher on different sites. “Housebuilders working together to build out large sites is quite common, but what this recent research shows is new entrants coming into the market in the shape of institutional investors,” adds Mr Wilén.